The Saturday night concert started with the Lionel Hampton Jazz Festival Big Band, loud and proud, led by Vern Sielert. Featuring a variety of guests, including Jason Marsalis on Vibraphone, Claudio Roditi on trumpet, and Julia Keefe singing, the band played a variety of songs including a song called 50 and Counting written by Vern and closed with a loud and proud arrangement of Lionel Hampton’s Flying Home featuring Jason Marsalis, in the style of Hampton, and a dancing trumpet section. The set then transitioned to the best student soloists from the day and each group played their best songs from their set. Then they all came together for a final group performance and one lucky soloist, Max Zhang from Semiahmoo Secondary School in Surrey, British Columbia, was named Outstanding Instrumental Soloist for bass and received a University of Idaho scholarship from Avista Utilities. 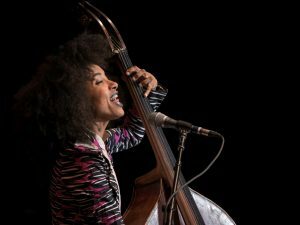 After a brief intermission, the stage was reset and, in an outfit far more colorful than the other two performances before her, Esperanza Spaulding took to the stage, had a casual conversation with the audience as she tuned her bass, and then began to play and sing. She was joined by Justin Tyson on drums and Matthew Stevens on guitar. She played a variety of different styles and genres from an Argentinian standard to a mash-up of Humpty Dumpty by Chick Corea and All The Kings Horses by Aretha Franklin because “Those songs just sound like they should go together.” Then Justin left the stage leaving Esperanza and Matthew to play a slow, free version of Have I Stayed Too Long At The Fair. Justin came back and the trio played a loud and engaging Endangered Species. Finally, after asking for some participation, Esperanza Spaulding led a rousing finale of Nina Simone’s Forbidden Fruit. The trio took their bows, the lights came up and as the they walked backstage that was the conclusion of the 50th Lionel Hampton Jazz Festival.